There are 9 French games designed to be easy and fun to play (and learn from!) with over 100 different topics. 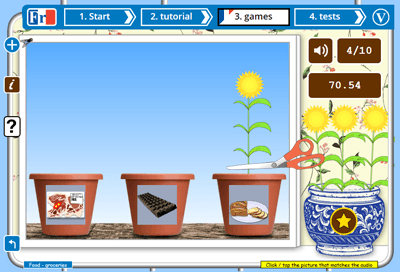 These online games are offered as part of a package of French learning activities for beginners which also includes simple French lessons and tests. 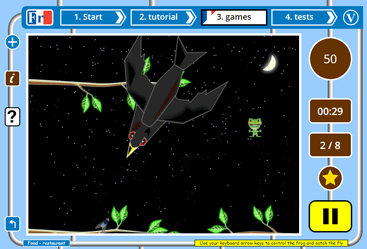 The frog flies - learn French with the little frog! The games we currently offer to help your French learning are: Mix and match, The beetle and the bee, Pelmanism, Four in a row, Hangman, The spelling game, The frog flies, Sow grow and Rock fall. 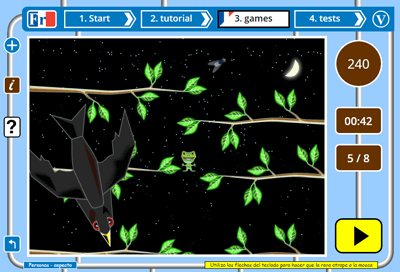 All our games are free to play and can be used with any of our free French topics. 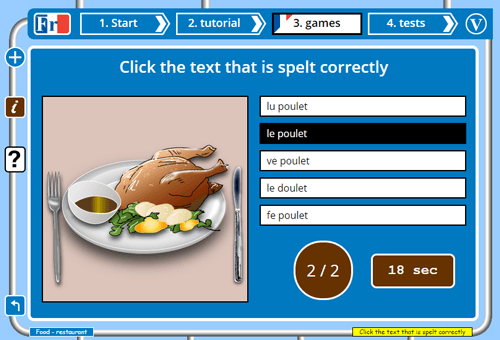 Most of the games are based on matching pictures to written or spoken French vocabulary and short sentences. 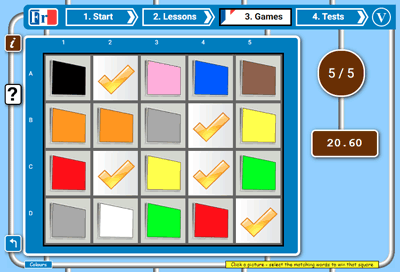 You should probably complete the lesson for a topic before you play the games so that you can familiarize yourself with the vocabulary for each picture. 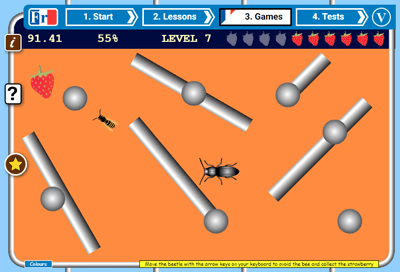 Most of the games are self-explanatory but we would like to tell you more about our adventure game, "The beetle and the bee". 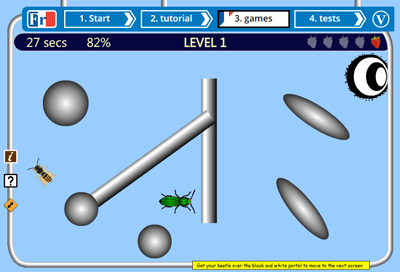 In this game you use your arrow keys to control a green beetle which is trying to collect strawberries whilst avoiding some angry, stinging bees. The bees take some life each time they sting you, and you must also navigate around lots of obstacles to reach each strawberry which is also moving about. There are 10 screens in 2 levels to complete. Each time you hit a strawberry you have to answer a question in order to keep it... it's a good game for making you forget that you are learning at all! This game can be played full screen by using the small orange double headed arrow button on the far left of the interface. Hangman is another fun game - you know the format, but you should check out our implementation - we think it is rather nice. All the games come with an info box (like this one) and a help box that can be accessed using the info and help signs respectively on the far left of the interface. The games are free free free to play! Click on the name of a game to go to that game page with the topic you have selected. 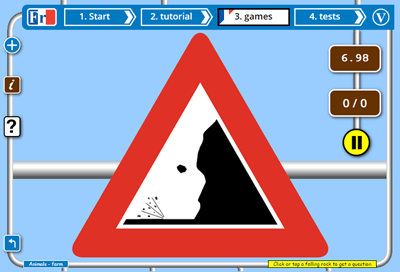 On the game page there are instructions on how to play the game in addition to a chance to change the topic you want to play with. All our French games are quick to play and easy to understand. You need to have seen the language you are going to play with before you play the games, either at school or using our own French lessons. Guess the item of vocabulary letter by letter from the on-screen keyboard - wrong guesses add pieces to the gallows being built on the beach. Great for reinforcing the spelling of words and emphasising the position / occurence particularly of accented letters in some French words.